Premium quality bulk pack of 30 pans. Half-Size "deep" size, ideal for cooking, broiling, bbq, baking, and much more. Designed to withstand the toughest kitchen environments. Proudly made in the USA with American sourced materials. 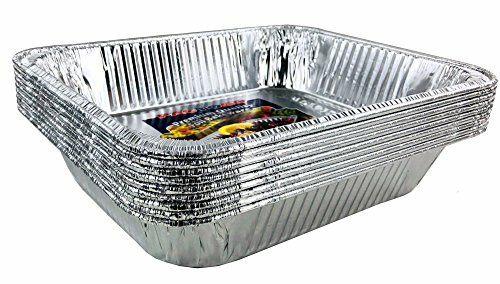 Pactogo bulk pack of 30 Half-Size Deep Pans (Lids NOT included). Top Out Dimensions: 12-3/4" x 10-3/8" I Top In Dimensions: 11-3/4" x 9-3/8" I Bottom Dimensions: 10-1/4" x 7-7/8" I Vertical Depth: 2-9/16"
These sturdy pans will not easily crush or bend, made with 40 gauge aluminum. Versatile pans, ideal for a variety of uses including broiling, cooking, baking, BBQ, carry-out, catering, parties, chafing, and more. Widely used by many high restaurants and caterers across America. No more messy clean ups, bake directly in pan, serve and discard/recycle. FDA Food grade approved, OU Kosher Certified. Proudly Made in the USA with American sourced materials.